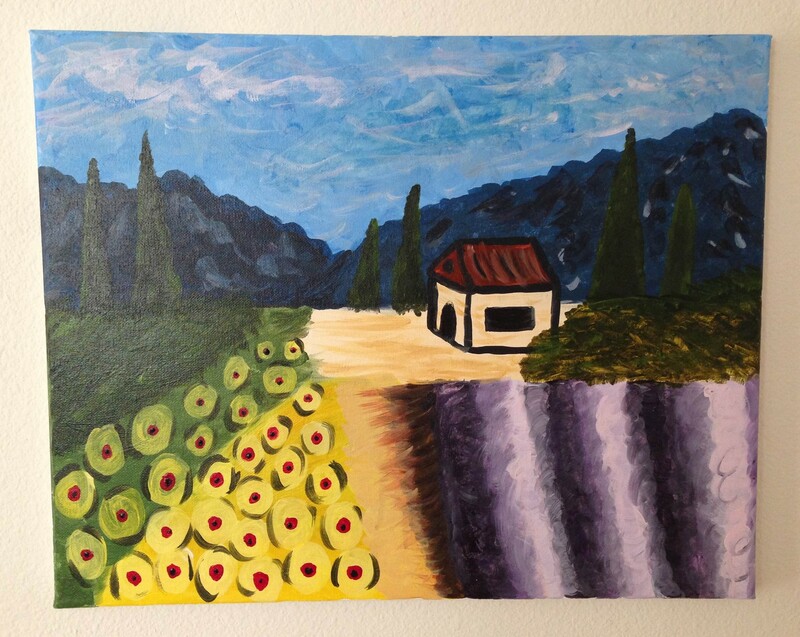 In my quest to check off another item on my 30-before-30 list, I signed up for a class at The Painted Cabernet, an art studio where people are guided through a painting while enjoying glasses of wine. Several friends had tried it and had an awesome time, so I was glad to sign up for an evening to open up my creative side. Unfortunately, I couldn’t find anyone to go with me. I thought about skipping the Friday night class, but I really wanted to go. So I went. When I told folks I was going to attend the evening alone, I got looks of pity. How on Earth could a single, 29-year-old woman do go out in public alone? For shame! I got to the studio early and it’s a good thing because I was able to select the seat I wanted and set up my paints and brushes for the night’s fun. I wandered around the studio and admired the other works that I could sign up for. It was a very lovely work space with high ceilings and large windows letting natural light into the studio. The bar was set up and I ordered my first glass of the night, eager to get started. A new canvas, clean brushes, paints, and wine. What more could an artist ask for? The teaching artist introduced herself and explained what would happen. She would give directions through each step of the painting and we would all end up with our own versions of the night’s work. 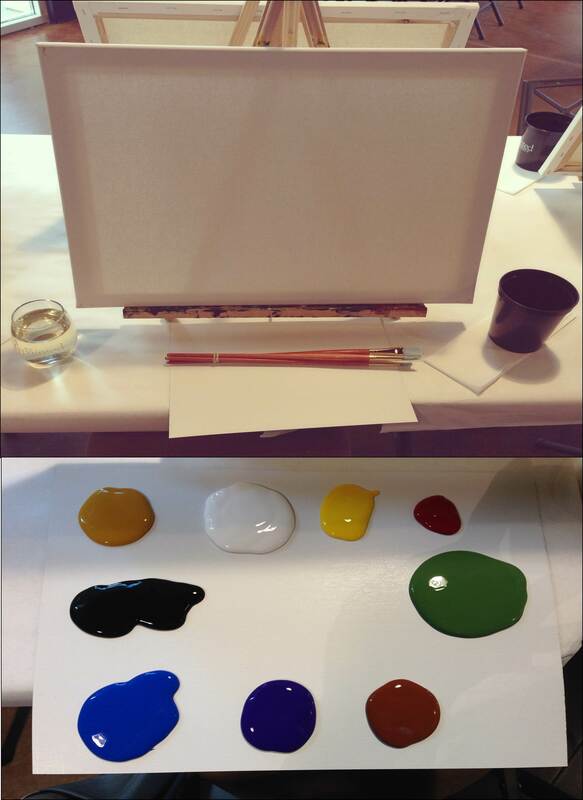 With little more than learning the names of the brushes, we were off, painting and drinking away. It was all so easy. The instructor clearly explained how to mix the colors we needed and the proper brush to use for the proper part of the portrait. I felt like I knew what I was doing the entire time. There were moments when I messed up and mixed a color too dark or painted further than where I was supposed to, but I didn’t let it derail me. Happy, dance-able music filled the studio and I was having a blast. But I might have been the only one. All around me, people were stressing out about their paintings. I can’t tell you how many times throughout the evening I heard, “Is this the right color?” or “Am I doing it right?” or “Mine doesn’t look like hers.” I was astonished at how seriously people were taking creativity. I was having a great time making the work my own and it seemed that everyone else was freaking out about getting it just right. 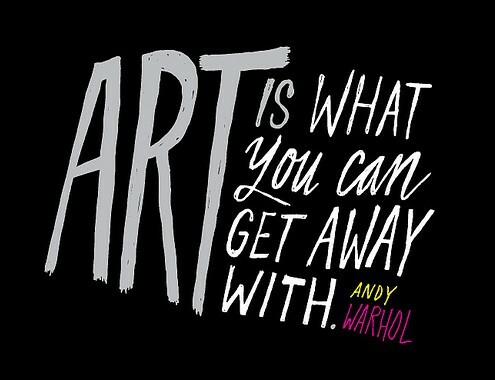 If there is one thing I have learned about art it is this: you can’t do it wrong. Pretty damn proud of myself! Yes, no two paintings in the room looked the same, but you know what? They all looked great! The lady to my left put a lot of detail into the mountains. Her mother next to her emphasized the sky. We talked, offered tips on how to make our paintings pop, and admired each other’s work. The two women to my right seemed to be having a miserable time because it wasn’t coming out exactly like the instructor’s. I even heard “I’m so disappointed in myself” from their direction. When the evening was done and my painting complete, I walked out of the studio with a sense of accomplishment and a huge smile on my face. I spent the night creating and, though I’m no Picasso and I don’t attempt to be, I felt like an artist with my own style. Art is about expression and no one expresses the same thing in the same way. You have to appreciate what you can bring to the canvas and how you felt as you turned nothing into something. There is no right or wrong, there is only art. It’s a lot of fun, Renee. The instructors are wonderful and so full of affirmations about creativity. Plus, the music they played had me dancing in my seat and having a jolly good time. 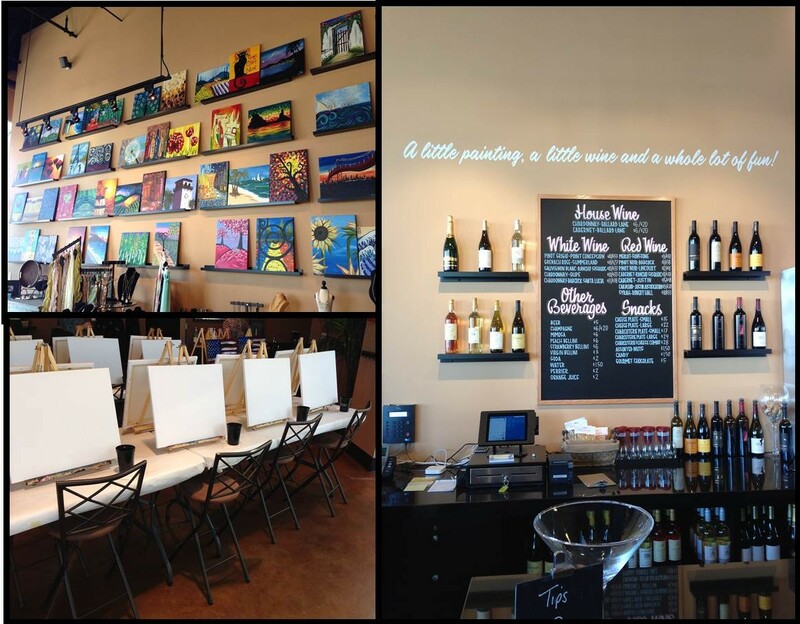 I’ve always wanted to go to one of these paint nights… they look so fun! It’s silly how caught up people get in details that don’t matter — the purpose is to enjoy yourself! Your painting came out lovely + I can tell by the smile on your face that it was an awesome time. So glad you did this Jessica! I did a similar thing – in fact painted a very similar picture – for my birthday last year. 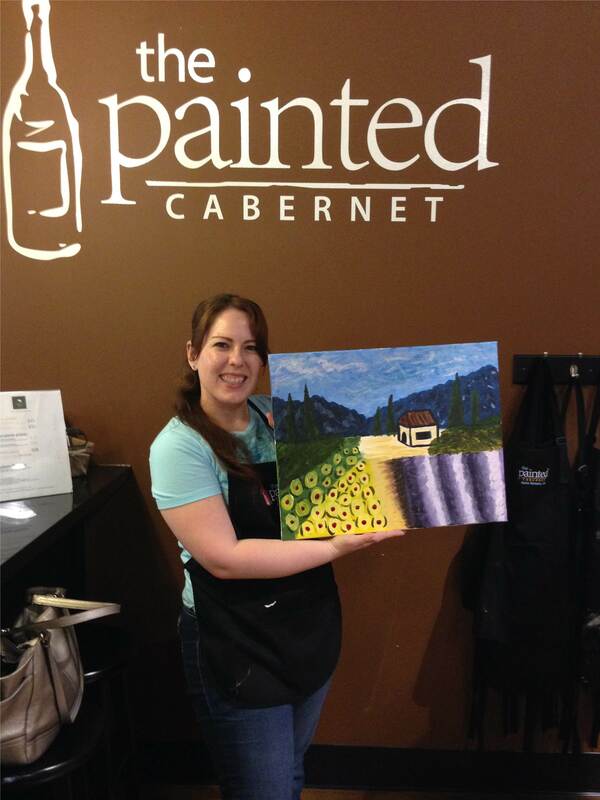 One of my good friends surprised me with a picnic-style lunch, wine and painting class. We had a blast. Don’t ever not go because no one will go with you; you’ll miss out on so very much. I bet you had as much fun as I did, Patricia. Funny that you went for your birthday as I’m taking my mom there next week for her birthday. I can’t wait to share the experience with her.